200,000,000 years ago, there lived a dinosauru family and many horseshoe crabs in a sea. Dinosaur family has four persons. Mother and three brothers. Their father dino has gone somewhere some years ago. So the children did not know who their father is. They live in the east part of the sea. On the other hand, there are so many horseshoe crabs live in the south part of the sea. 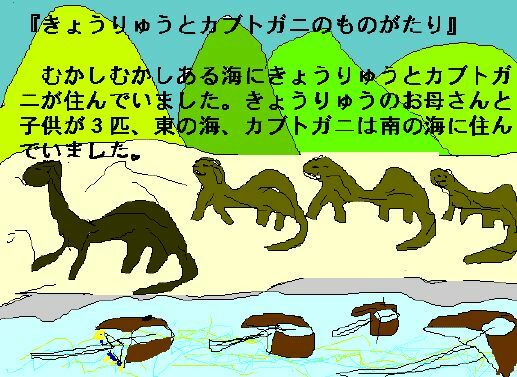 One day three dino's children were walking around the sea. There came a big wave. So the eldest dino's children disappeaed suddenly. Two dino's children were so much worried and hurried back to their home. But they lost the way to their home. What do you do next? How do they know the way to their home?